The Incuse Indian design featured on the Golden State Mint’s Incuse Indian Silver Round is one of the most notable from American history. Introduced in 1908 on two of the nation’s prominent gold coins of the era, the Incuse Indian was the first-ever coin design in the US struck into the surface of a coin rather than engraved onto the surface with 3D elements. Today, 1 oz Silver GSM Incuse Indian Rounds are available to you online at Silver.com. Rounds ship to you inside of individual flips or tubes of 20! The largest weight for the Incuse Indian silver rounds from GSM! 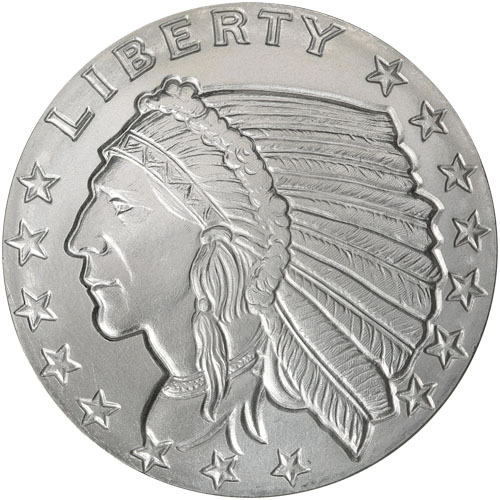 Obverse bears the left-profile portrait of a Native American leader. 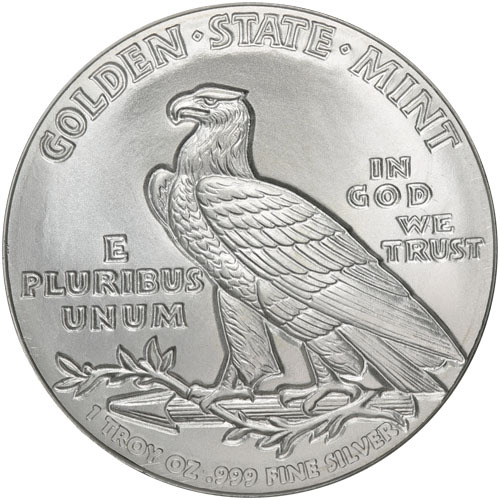 Reverse includes the image of an American bald eagle. Struck as an incuse design! Bela Lyon Pratt created a distinct design for the Gold Eagle series of circulation gold coins. The longest-running coin program, launching in 1794 when the first-ever US coins were issued by the US Mint, the Gold Eagle series included the $10 Gold Eagle, and its counterparts in the Double Eagle ($20), Half Eagle ($5), and Quarter Eagle ($2.50). At the turn of the 20th century, the United States Mint rolled out new designs for many of the Gold Eagles of the day. However, various denominations ended up with different designs. Among them, a unique take on the so-called Indian Head Eagle that featured on the $10 Gold Eagle. All 1 oz Silver GSM Incuse Indian Rounds in this listing feature the Bela Lyon Pratt design from the Half Eagle and Quarter Eagle. The design elements are stamped into the surface of the coin rather than being engraved onto the surface of the rounds. The rounds are available inside of protective plastic flips or tubes of 20 rounds. On the obverse is the left-profile portrait of a Native American tribal member wearing a large, feathered headdress. Engravings include the word “Liberty” above and 13 stars around the figure’s bust. Golden State Mint struck this design on silver rounds based upon the images found on the Half Eagle and Quarter Eagle between 1908 and 1929. Golden State Mint is a private mint in the US founded in 1974 and operating facilities in Southern California and Central Florida. Please feel free to reach out to Silver.com with your questions. Our customer service team is available to you at 888-989-7223, online using our live chat, and via our email address.